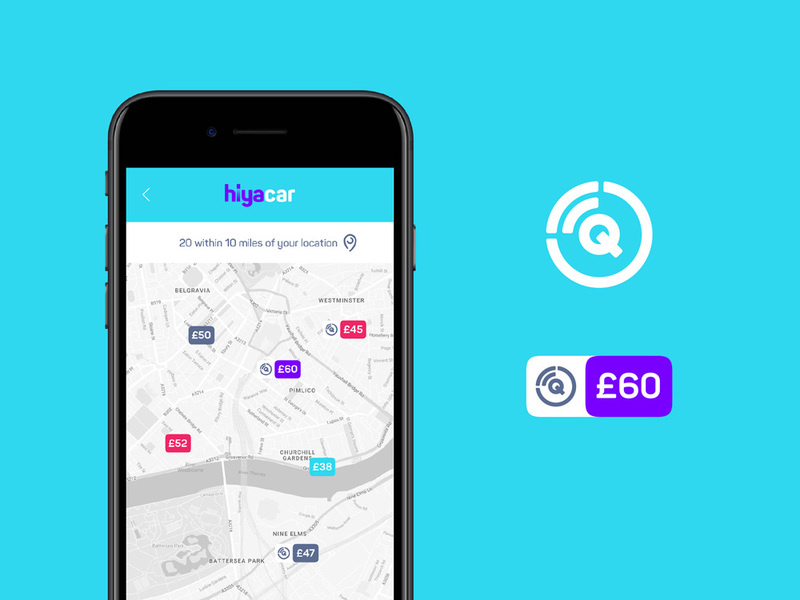 Launched in 2016, HiyaCar is a peer to peer car-sharing platform in the UK. It allows car owners to rent their car — providing them with an extra source of income — to people who sign up to the service — providing them with a rental car at a fraction of the cost and a fraction of the hassle in contrast to national car rental companies. Car owners install a box in their dashboard that allows the cars to be opened through the app so there is no need to hand off keys. According to this story, HiyaCar currently has 20,000 members (9,000 of them in London) with 1,000 cars available for rent. 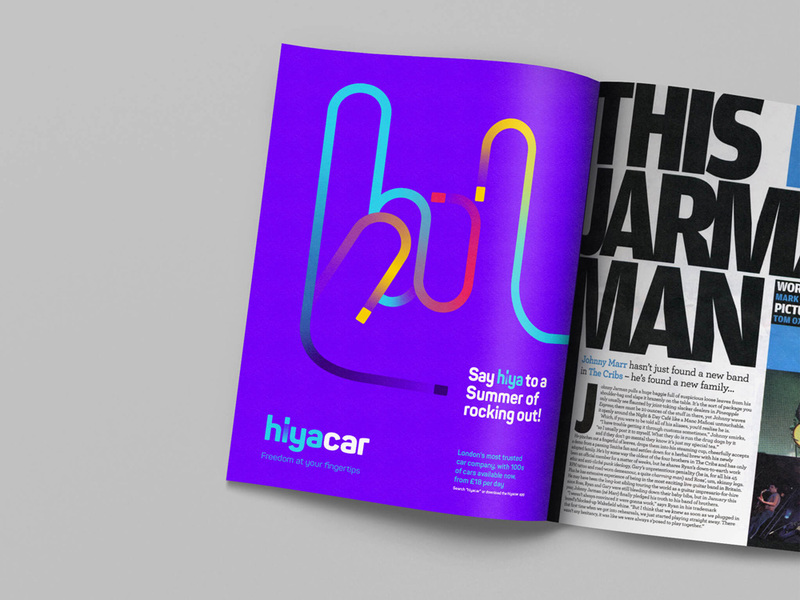 Looking to grow the business (and hopefully become the Airbnb of car renting), HiyaCar recently introduced a new identity designed by London-based SomeOne. 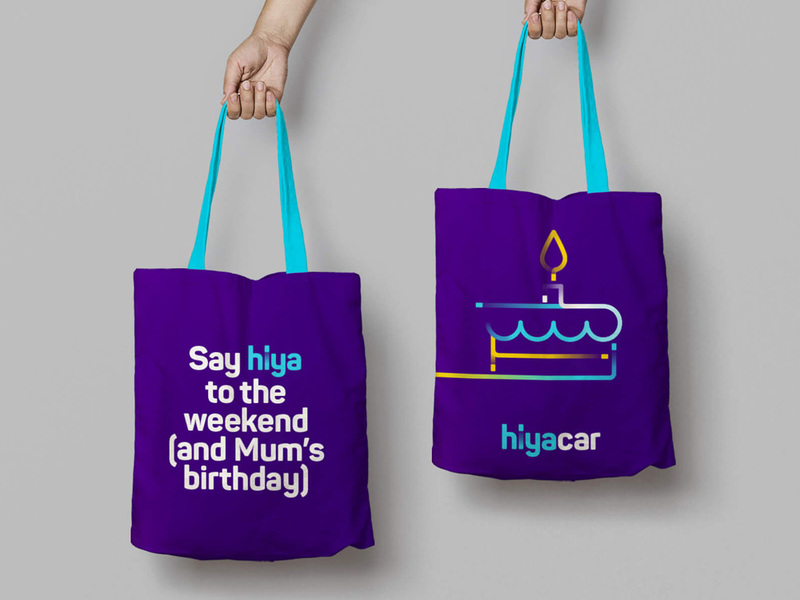 Most hire car branding is based on a single colour and a single static word mark… Hiyacar takes the opposite approach. A multicoloured palette of choice, with animated elements as standard, after all, this is a digitally-led service, so things should flex, adapt and move. Pointing out that the old logo was bad is almost mean given how naive that car with headlight eyes and grill smile looks but, yeah, it was lame. The wordmark was sort of passable but the combination of characters — “iy” or “Ca” — yielded some odd kerning pairs. The new logo drops the car icon in the junkyard and solves some of the conflicting letter pairings with a font — Panton — that eschews angles and allows for a tighter setting and highlighting the “i”. The “r” gives me the heebie-jeebies but I think by now y’all know that. 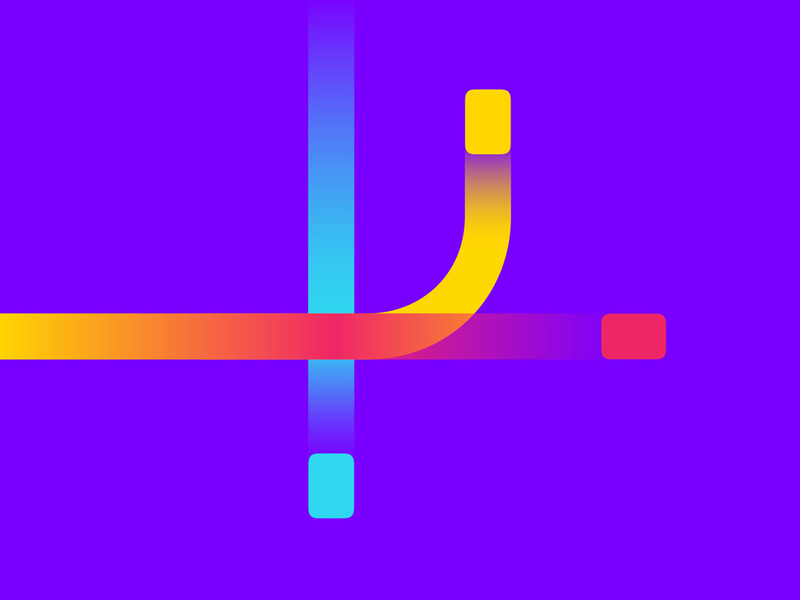 The new logo looks techie, friendly, and, because of the name, the tittle of the “i” easily reads as a car. The identity revolves around illustrations and compositions of colorful “trails” that are meant to represent cars on the road zooming along. They are enjoyable, unique, and yield interesting textures, especially on the darker backgrounds. The one thing that I find conflicting — and maybe it’s just me — is the use of “hiya” as a replacement for “hire” as well as a colloquialism for “hello”. This is especially evident in the website where both instances are used freely. Maybe some will see it as a benefit to the flexibility of the name but to me it seems like it could dilute the name being interchangeable with two different meanings. Anyway… overall, this has a positive, cheerful, colorful vibe that should help encourage people to rent their cars to strangers and strangers to take care of the rented cars. 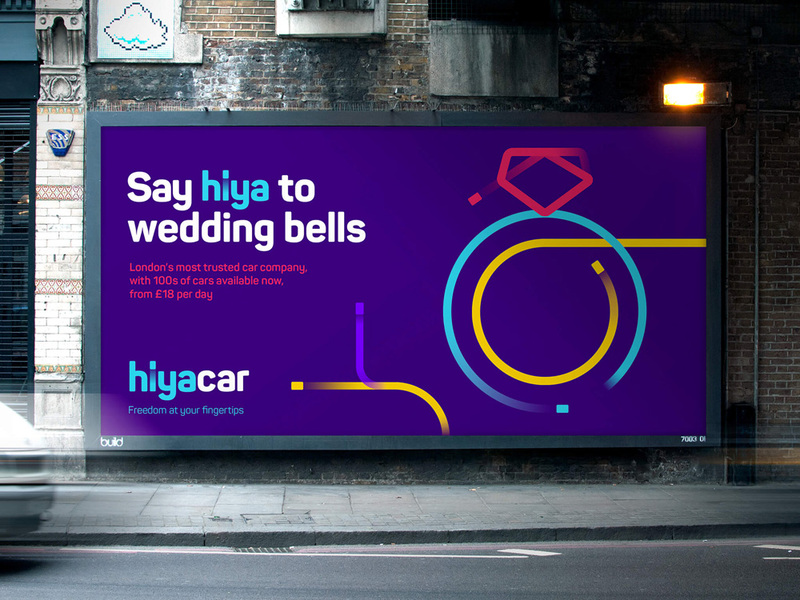 Launched in 2016, HiyaCar is a peer to peer car-sharing platform in the UK. It allows car owners to rent their car -- providing them with an extra source of income -- to people who sign up to the service -- providing them with a rental car at a fraction of the cost and a fraction of the hassle in contrast to national car rental companies. Car owners install a box in their dashboard that allows the cars to be opened through the app so there is no need to hand off keys. According to this story, HiyaCar currently has 20,000 members (9,000 of them in London) with 1,000 cars available for rent. 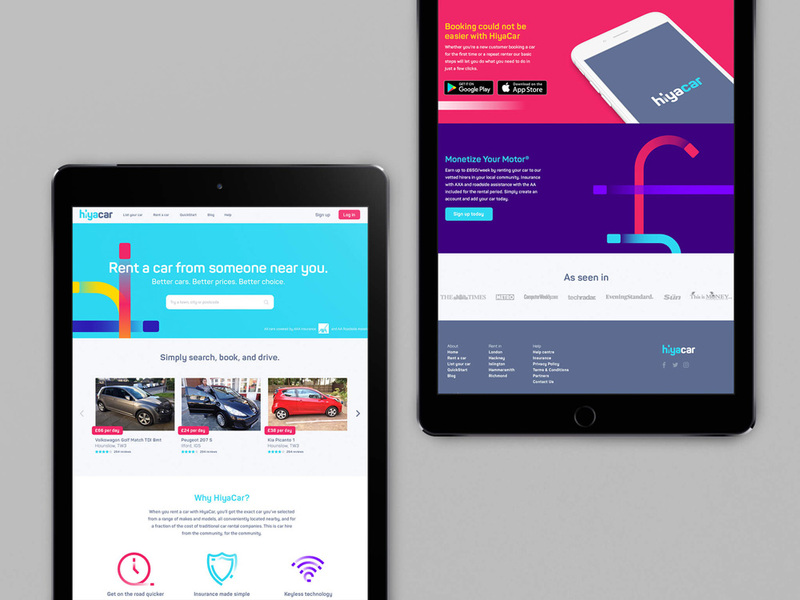 Looking to grow the business (and hopefully become the Airbnb of car renting), HiyaCar recently introduced a new identity designed by London-based SomeOne.